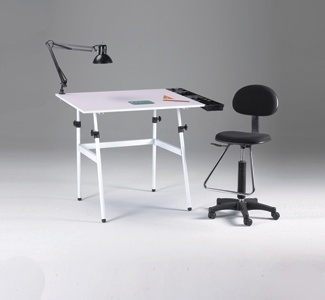 This Berkeley Classic Combo, includes our most popular Drafting height chair in black with Chrome footrest, along with our Black Clamp-on desk lamp, Table height from flat 29-53". Black Side Tray for tools and reference material. Legs fold in and top hinges down to store easily out of the way. Includes a 30x42 top surface. (Requires assembly).